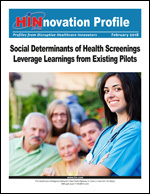 HIN webinars and workshops provide exclusive and actionable information on a wide variety of healthcare topics. healthcare executives. Your one-stop shop for the leading publications you need! or conduct key word searches to find the products that best meet your needs! Take the survey. Healthcare was a top priority for many U.S. voters during the 2018 mid-term elections. With the close of the elections, the regulatory implications for the healthcare industry are beginning to take shape. Healthcare executives are further refining their 2019 strategic plans to reflect these implications. Please share your thoughts about how your organization was preparing for 2019 and any strategic changes based on the election results as well as what 2018 meant for your healthcare organization by completing HIN's 15th annual survey on Healthcare Trends by January 25th. You'll receive a free executive summary of the compiled results, and your responses will be kept strictly confidential. We value your input. One respondent who completes the survey will be randomly selected to receive an Adobe PDF of HIN's 2018 special report, "Profiting from Population Health Revenue in an ACO: Framework for Medicare Shared Savings and MIPS Success," a $90 value. Complete the survey today! Download more survey results on population health management, remote patient monitoring, and much more. Your name will not be rented to anyone. This Week's Insight: AltaMed Health Services Corporation's care coordination staffing ratios are based on the health plan requirements and it's standard of excellence. They also built the ratios based on projected enrollment, projected increases in the CalMediconnect population and placed considerations for any technology efficiencies or inefficiencies, according to Care Coordination of Highest-Risk Patients: Business Case for Managing Complex Populations. 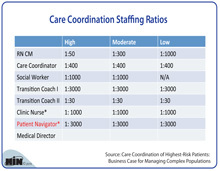 Click here to view a shareable version of the chart to see see the staffing ratios for the members of the care coordination team. For access to a case study on AltaMed Health Services Corporation's care coordination approach for complex patients, download your copy of Care Coordination of Highest-Risk Patients: Business Case for Managing Complex Populations today. Susan Lehrer, RN, BSN, CDE, associate executive director of NYCHHC’s telehealth office, describes the work environment of care managers in the House Calls program, a blend of telehealth and telephonic case management for patients with diabetes, and comments on case load assignments. he Healthcare Intelligence Network (HIN) is an electronic publishing company providing high-quality information on the business of healthcare. In one place, healthcare executives can receive exclusive, customized up-to-the minute information from more than 50 of the nation's leading healthcare publications in five key areas: the healthcare and managed care industry, hospital and health system management, health law and regulation, behavioral healthcare, and long-term care. We are constantly updating this site and looking for new information to give you. Is there something you can't find? New features you'd like to see? Let us know! Thanks for visiting. We hope to see you often!